Animated GIF images are a good method for demonstrating your application, library or framework UI functionality and features: as one picture tells more than thousand words, one animation tells more than your average megapolis telephone directory. Autoplay! When your clip is 1-3 seconds you really don’t want to put it behind play button. 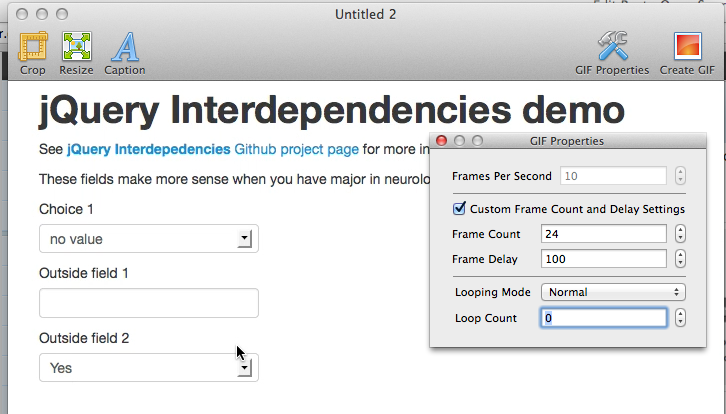 Here are short instructions how to create animated GIF screen recordings on OSX. The resulting h264 MPEG5 as .mov file needs to be post-processed to animated GIF. I found GIFBrewery (~5 USD) suitable for this purpose. You could do it by hand with free software, but GIFBrewery provides nice “tune settings and see live preview” style functionality which saves a lot of your valuable time. Note: I had a bug in GIFBrewery where the animation colors got screwed up if I tried to to move starting frame (probably related to h264 key framing?). Try to make the target area as small as possible. Resize your browser window, zoom out fonts, use lower resolution and such tricks. You can do further cropping in GIFBrewery. Set animated GIF frames per second to low number like 3 -5 frames per second. FPS is not usually critical factor for screen recordings where your purpose is to demostrate the UI element interaction. OSX may do font subpixel antialiasing by default (some more info). You might want to turn off this for screen recordings, as subpixel antialiasing is tied to (your own) monitor and may create funny looking color artifacts on other displays when your recording is being viewed. ImageOptim is an OSX application which will optimize all dragged and dropped images in place. For me, it provided 33% saving in the GIF size for GIFBrewery exported files. This entry was posted in html5, osx, plone, python and tagged gif, h264, mpeg4, osx, quicktime, screen capture, screen recording, screenshot, subpixel antialiasing, video by Mikko Ohtamaa. Bookmark the permalink. Thanks for this very useful tip for small screencasts. BTW, screen recording is available on Quicktime player that ships with OSX Snow Leopard. Veeery nice! Thank you Yuri. Besides of single-image capture, can record part of screen to animated PNG (APNG) or video. If you are using Mac, I think you may like this app to record your screen and turn it into GIF images easily.